18th March, 2011. Huge list of prize winners announced - $10 Membership special offer - New Holiday In... series - 20% discount off special and more! CONGRATULATIONS TO ALL ON OUR HUGE WINNERS LIST!!! This series of new books from Explore Australia has just arrived in our warehouse and is now available forACT , NSW, NT, QLD, TAS, VIC, and WA (SA is coming soon). 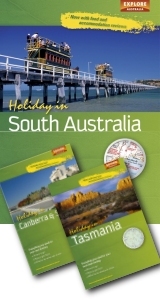 These fantastic state holiday guides contain a complete state road atlas, and focus on the state’s accommodation, attractions and restaurants by region. The Holiday In.. series are perfect for helping you get the most out of your next trip – they’re also ideal for planning activities, meals out, and short trips near home. The Complete 4WD Guide covers Australia’s greatest 4WD touring routes and is a must-have for every 4WD enthusiast. For a limited time only, we’re offering 20% on this title - that’s only $39.96. To take advantage of this special price just click here. On March 8th, one lucky ExplorOz Member headed off to the Flinders Ranges as an ExplorOz representative at Toyota's grand unveiling of the new FJ Cruiser. Who was it? Find out what they had to say in this BLOG. Well not quite, but certainly the upgrade from a 32 bit environment to a full 64 bit operating system in both web servers and database servers that occurred on Tuesday night is a huge step forward for the ExplorOz website. There are a few glitches (because the new system doesn't support some of the existing custom software) so until those issues are fully resolved you may still find a few resident bugs lurking around. 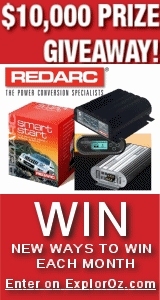 Please let us know any errors you find, as that helps us speed up the testing process. Rest assured, the new system is the state of the art platform and will mean ExplorOz has the best backbone for further growth. Do you know someone who is thinking of doing their first triathlon, or is already a keen triathlete or multisport enthusiast? Then tell them about TriathlonOz.com and our opening membership special, which is reduced to just $10 instead of $50. This is a limited time opening special and won't last long!